AMARILLO, TX (KFDA) - The American Medical Response Therapy Dog team in Amarillo returned to Las Vegas this month. The project coordinator for AMR, Lauren Christie, said they were in Vegas to comfort first responders who were on the scene of the deadliest shooting in U.S. history in October of last year. “We wanted to make sure that we were there for them just in case there was any, you know, lingering remorse or possible flashbacks that they would experience,” she said. 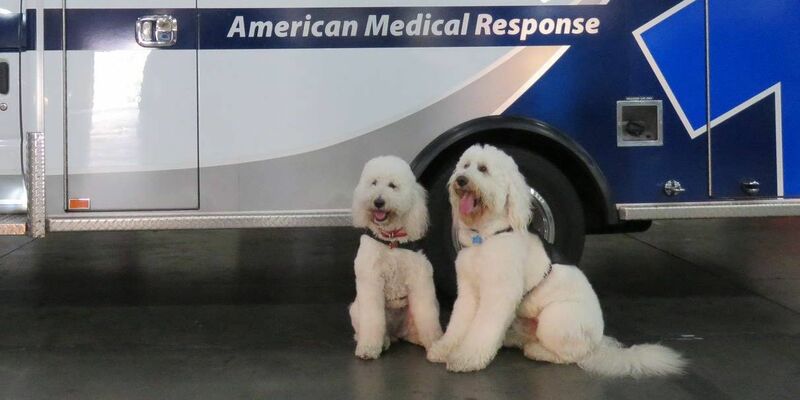 Saydee and Bodhi, the golden doodles who live with the EMT’s at Amarillo Medical Services were there to support a community still in mourning. “As soon as the dogs walk in though you get those smiles on those personnel’s faces and you’re just like ‘Okay, they’ve done their job.’ So it was really amazing,” said Christie. She also said the AMR therapy dog program that was piloted in Amarillo is growing across the country. Three of Saydee and Bodhi’s offspring are currently in training to become certified therapy dogs. “They’re a little over five months old right now, one went to Las Vegas, one is in Tulsa, Oklahoma and one’s in Oklahoma City and we actually are getting to add a fourth member in the Gulf Port, Mississippi area in December so we’re really excited about that,” said Christie. AMR also plans to grow their therapy dog program with 911 providers. Saydee and Bodhi are now in Tallahassee, Florida to console those who are working Hurricane Michael relief efforts. Christie hopes emergency response providers will consider providing therapy dogs for the difference they can make for first responders at home and abroad. “I’m so proud that AMR is the one that kind of innovated this and started this but I, of course, would love any other EMS provider or first responder entity to add this to their program because it is important, like I said, that the first responders aren’t forgotten about and their emotional needs after a tragedy," she said.